This set of three squirrels in the "Hear no evil, see no evil, speak no evil" lineup, their cheeks stuffed with birdseed, ask "Birdseed? 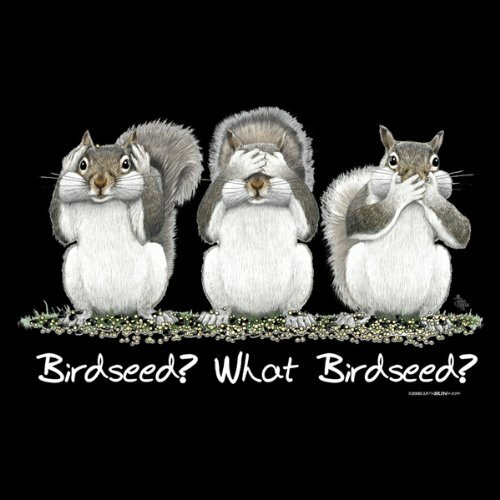 What birdseed?" Available in generic "adult" sizes, you can buy this shirt here. This funny squirrel shirt is great not just for squirrel lovers, but for anyone with a good sense of humor. A negative aspect of this design is that it is hard to tell exactly what the text says underneath the last word. Is it a copyright mark, an artist's signature, or something else? Lots of other t-shirts do this, too, and most people don't seem to mind. I just think it's in bad taste. Nevertheless, it's relatively inconspicuous, and the shirt is hilarious. Go for it!